Pierre Vial chose cold materials to contrast the warm, richly textured Douglas fir on the walls and ceiling of the living room. The concrete fireplace has built-in bookcases on the sides. The floor has a colored concrete finish that has been swirled into patterns. 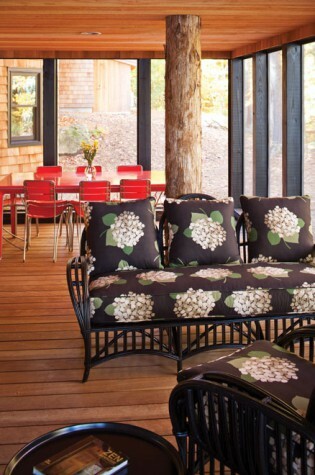 The screened porch features a mix of rustic and contemporary styles typical of the entire home. The red table and chairs in the background are by Eric Ritter of New Gloucester. 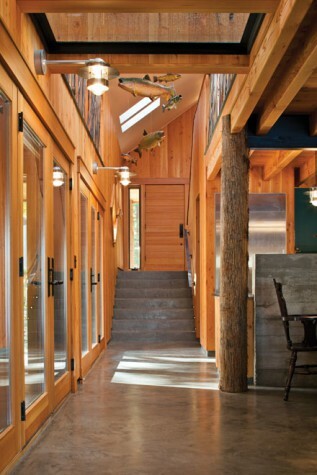 The builder chose cypress for the home’s interior posts because the wood doesn’t shed its bark after it has been cut. Vial repainted the wicker couch in the foreground, and Frank Gagnon’s Upholstery in Lower Village Kennebunk made pillows to match. 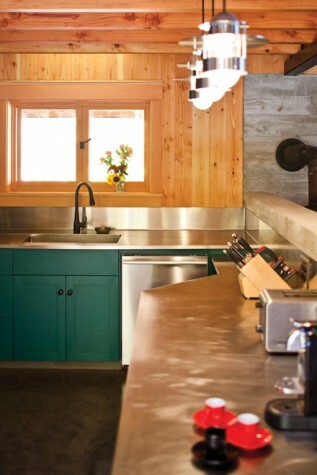 The galley kitchen showcases the principal materials used in the home: Douglas fir, stainless steel, and concrete. Although a typical kitchen’s countertops are two feet deep, these countertops are three feet deep to allow more working space and ample interior storage in an otherwise a small kitchen. The birch cabinets have been painted a camp green. Vial designed his house to be low in order to facilitate a view through the trees. Here, the view is from the lake up to the living room’s bay window. 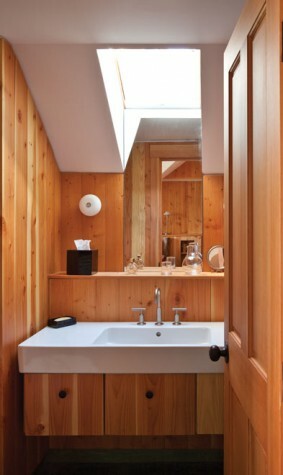 The wall-hung custom vanity in this bathroom is made of Douglas fir, as are all the bathroom vanities in the house. In addition to the main house, the Vials have a cabin by the water, built on the footprint of a structure that dated from the 1920s. 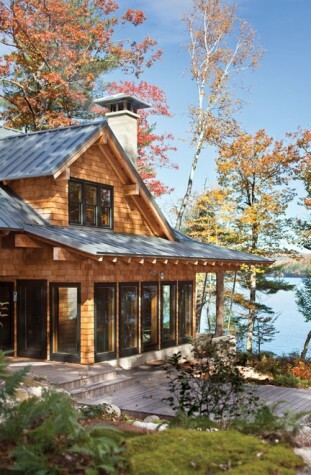 The waterfront cabin is like the main house in miniature. 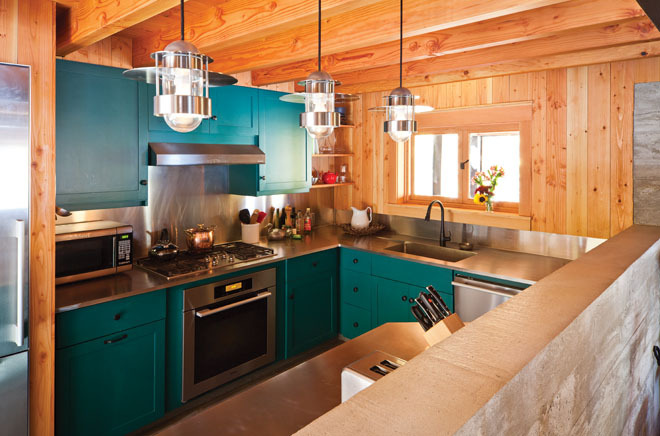 The interior is part Maine camp—all the interior wood has been painted a barn brown—and part contemporary surprise, with pops of mint green furniture. 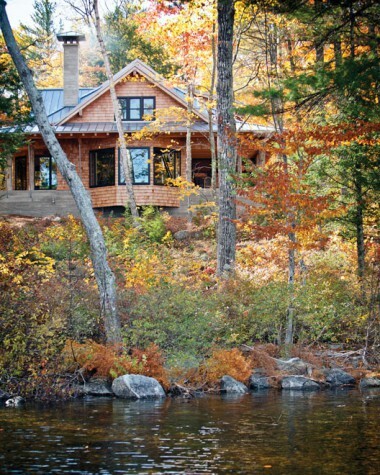 Adirondack camp meets European chic on Kezar Lake. Forget about GPS and MapQuest. If you are going to get to the lakeside retreat of Charlotte and Pierre Vial, you are going to need old-fashioned help. To wit, the gracious couple will meet you at a marina in western Maine. They’ll guide you deep into the forest along dirt roads until you arrive at a clearing in the woods. 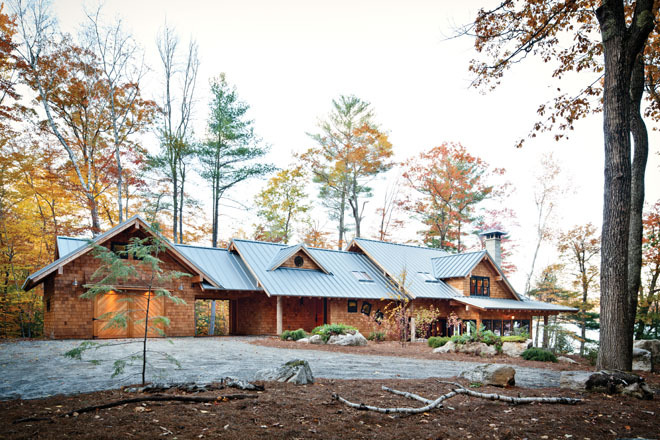 Here, amid oak and hemlock trees, you’ll find a broad-roofed timber-frame house shingled in western red cedar. Sitting by Kezar Lake in perfect quiet, the house will seem worlds away, even from the sleepy country roads you have just left. The story of the Vial home begins with a romance. Pierre Vial, child of the French Alps, moves to Paris to fulfill his dream of becoming an architect. One day after class at the École Nationale Supérieure des Beaux-Arts, a friend invites him to a nearby cafe. There Pierre meets Charlotte, a young woman from Biddeford Pool, who has come to the city to learn French. Two years later, they marry. Flip one calendar and then another and still others to see them settle in Paris for 14 years, move to Evian for another 35, and raise three children. All the while Pierre designs private houses, office buildings, apartments, and small factories. Finally, slow the calendar pages and stop on a single year: 2005. A group of French architects arranges a tour of modern architecture in Finland. The Vials decide to go. With its lakes, forests, and red barns, Finland reminds them of Maine. In the bus, admiring the scenery, Charlotte feels inspired. She wants to build a house on a Maine lake. Why not? The children have grown up, gone to college, and settled in the States. Perhaps it’s time that she and Pierre move, too? A year later, Charlotte arrives in Maine to scout property. She knows exactly where she wants to go: a lake in the western part of the state. She knows the lake because she and Pierre visited it 30 years prior. At the time, Charlotte wanted to show Pierre a “real” lake. Until that point, he had experienced only what he calls “civilized lakes,” such as Lake Geneva. A lake in the woods was another matter. “I must admit,” he says of that long-ago visit, “I was blown away.” By late 2006, the Vials are in Maine, living in Biddeford Pool and building a second home by the lake. “My idea for the house,” Vial says, “was for a big roof that would be very protective and wide and would suggest the character of the house. 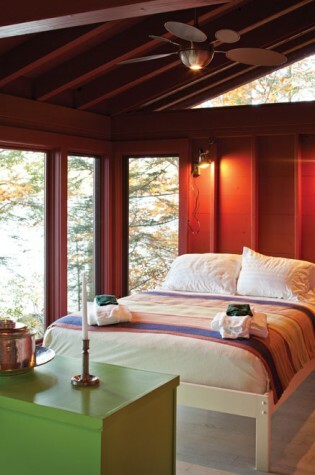 It would be someplace where you would feel protected and cozy.” Thus, the ceilings are low, the rooms small. In addition to several bedrooms and baths, the house includes a sunroom, screened-in porch, galley kitchen, dining room, and steam room. The largest space is the living room, which has a substantial bay window that offers a grand view of the lake framed by birches. In a sense, the house marries what the Vials have married: Maine and France. 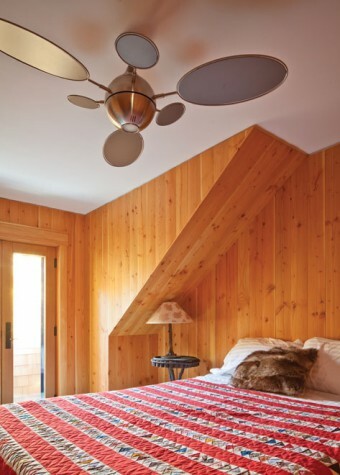 The New England influences are evident in the camp decor and the abundant use of wood. The house features tables purchased in the Adirondacks, rustic bed frames, a pot-bellied stove from western Massachusetts, antique quilts, Brahms Mount blankets, and bed pillows that have been made from old raccoon coats. Roderic Blood of Rod Iron Designs in Lovell made steel rails that look like metal twigs for an upstairs balcony. 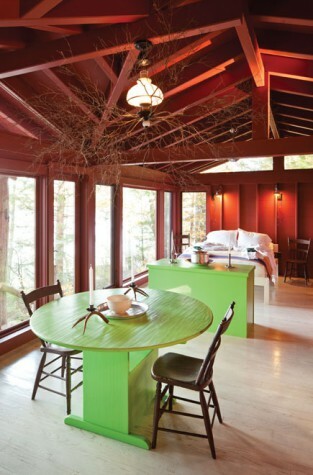 Builder Gary Crowell of Crowell Construction in Harrison painted the wood of the kitchen cabinets and the bedroom floors with the deep green paint that is so often used in Maine camps. 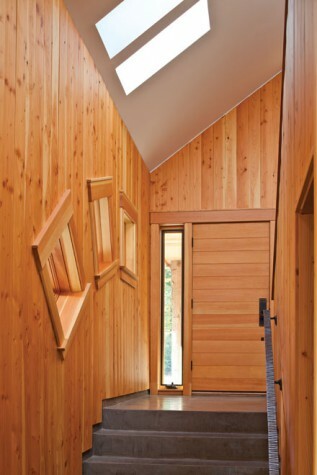 Elsewhere, unpainted Douglas fir dominates. 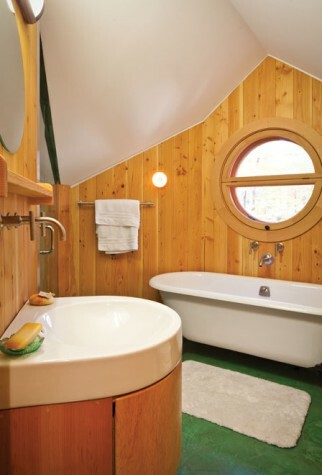 It is used for the interior walls and built-ins, including the custom bathroom vanities. The European influences are apparent in the decidedly contemporary fixtures, furnishings, and accent materials. Pendant and wall lights in the kitchen and dining area are of a Danish design. A glass bridge separates an upstairs office from a bedroom corridor. The living room fireplace, kitchen half-wall, bathroom shower stalls, and downstairs floor are all concrete. 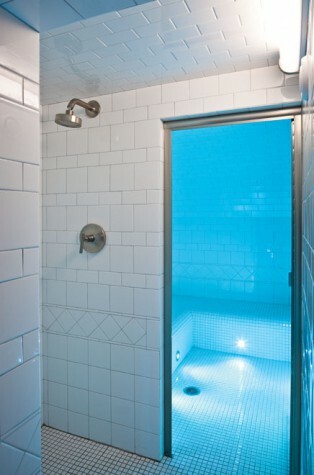 On the shower stalls and floors, the concrete has a skim coat of colored, marbleized concrete. For the chimney and half-wall separating the dining area and kitchen, mason Wayne Libby of Stow poured concrete into rough-board forms to produce a wood-grain finish. (“I’ve done just about everything else,” Libby laughs about the concrete chimney, “but I’ve never done anything like that.”) The steam room was laid with tiles that are reminiscent of the white tiles of the Paris Metro. “We almost wrote the name of the lake in blue tiles, as if it were a station, but we refrained,” Vial says. Of course, some details can’t quite claim a nationality, such as the stainless steel in the kitchen, which was custom fabricated by Tigpro in Portland. Pierre didn’t want to introduce too many different materials into the house, and because the appliances were already going to have some stainless steel, he decided to extend this material to the counters, backsplash, and drain board. 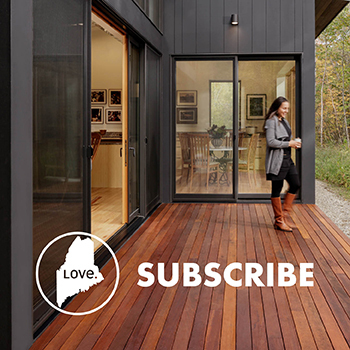 Green design is very important to Pierre, and the house uses geothermal heat thanks to two exterior wells, a geothermal pump, and radiant in-floor coils on both the first and second floors. 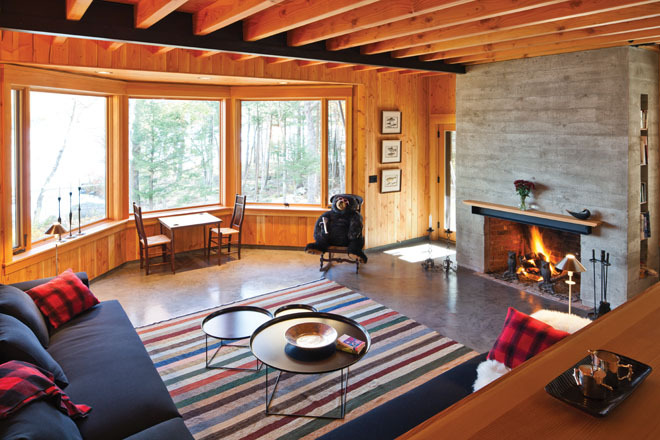 To make geothermal heating effective, the house had to be superinsulated. Crowell spray-foamed the wall cavities with Corbond and then added two additional inches of polystyrene foam and plywood before he finished the walls with interior paneling and drywall. The house, built on a gentle slope descending to the lake, is designed to hug the land. When you walk into the front door, you take a few steps down to reach the front corridor and then a few more steps down to reach the living room. Because the ceiling height doesn’t change, the rooms get bigger as you descend, creating real visual drama: the entire house seems to open up as you move toward the beautiful view from the living room. If the home he actually did build for himself is any evidence, it certainly will work.